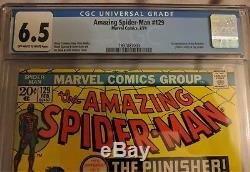 Up for sale is a CGC graded (6.5 OW/W) copy of Marvel Comics' Amazing Spider-Man #129. This is a key issue that features the 1st appearance of the Punisher and the Jackal. 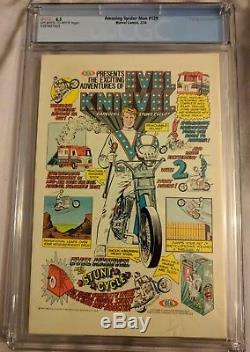 I'm in the process of helping my godfather sell his (impressive) comic book collection. I just got this book onsite CGC graded at the Baltimore Comic Con. As such there is no damage to the case or anything at all. The CGC grader notes said the following. Water stain right bottom of back cover. Feel free to message with any questions. 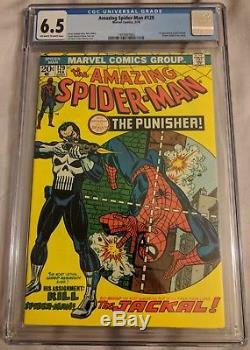 The item "Marvel Comics Amazing Spiderman #129 CGC 6.5 1st Appearance of The Punisher" is in sale since Tuesday, October 9, 2018. This item is in the category "Collectibles\Comics\Bronze Age (1970-83)\Superhero\Spider-Man". The seller is "rippleofhope" and is located in Pawtucket, Rhode Island. This item can be shipped to United States, Canada, United Kingdom, Denmark, Romania, Slovakia, Bulgaria, Czech republic, Finland, Hungary, Latvia, Lithuania, Malta, Estonia, Australia, Greece, Portugal, Cyprus, Slovenia, Japan, China, Sweden, South Korea, Indonesia, Taiwan, South africa, Thailand, Belgium, France, Hong Kong, Ireland, Netherlands, Poland, Spain, Italy, Germany, Austria, Israel, Mexico, New Zealand, Singapore, Switzerland, Norway, Saudi arabia, Ukraine, United arab emirates, Qatar, Kuwait, Bahrain, Croatia, Malaysia, Brazil, Colombia, Panama, Jamaica, Chile, Costa rica, Trinidad and tobago, Guatemala, Honduras.